Beignets in Houston are delicious and easy to find now, but where did they come from? What’s their history? If you have never had a beignet in Houston, you have got to try one! They’re warm and delicious! Beignets – Square donuts with dough that is deep-fried and coated in powdered sugar. Deep frying food has been a way of life for people all over the world for many decades, and even dates back to 5th century BC. There are several kinds of beignets, though, depending on the part of the world you’re in. French-Style – Though typically filled with fruit or jam, they can also be filled with meat, cheese, potatoes, or seafood. Boules de Berlin – Yeast pastry is another way to make beignets. These are typically sphere-shaped and filled with fruit or jam. Corsica Fritelli – In Corsica, these donuts are made with chestnut flour and referred to as Beignets de farine de châtaigne. Early French settlers brought beignets overseas with them when they migrated to Acadia on the eastern Canadian coast in the 17th century. The dessert’s French influences reached the region of New Orleans in the 18th century. 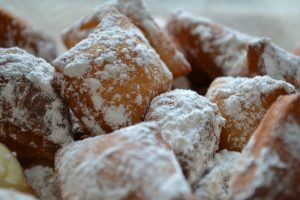 The ancient French colonists brought the custom of serving sweet entrements and eatres, such as Beignets, Compotes, Souffles, Gelees, etc., from the old mother country to Louisiana. The Creoles applied these to the various delightful and refreshing fruits, which abound in Louisiana . . . The custom of serving these sweet entrements spread from New Orleans to other portions of the United States, ’til now no fastidious chef would think of keeping a fashionable hotel or restaurant without including some of these in the daily bill of fare. Cafe du Monde opened in 1862 in the New Orleans French Market. 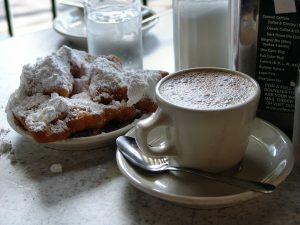 Their cafe au lait and beignets quickly became famous, and lines to purchase these treats grew longer and longer over the years. This NOLA landmark is still open 24/7 and serves beignets in sets of three. In 1928, a tourist bribed Cafe du Monde’s Louis Gillette $250 for their famous beignets recipe, but he refused to tell the secret. Get the Best Beignets in Houston at Shipley Do-Nuts! Eager for more history lessons? Click here to learn about the history of Shipley Do-Nuts. For the best beignets Houston has to offer, order now from Shipley Do-Nuts. You can order online instantly for yourself, your friends, or your office! It’s easy. Just click the button below to start your order. Shipley Do-Nuts beignets are always made-to-order, so they are always hot & fresh. We serve them the traditional way, covered with fine powdered sugar. You can also order them rolled in cinnamon-sugar, granulated sugar, with a side of honey, or naked. article is awesome, great written and come with almost all important infos. web. Shame on the seek engines for no longer positioning this publish higher! that, this is wonderful blog. A fantastic read. I will definitely be back. really liked every little bit of it and I have you book marked to look at new things on your website. it to a few pals ans additionally sharing in delicious. And obviously, thank you to your sweat!